I look at wallpaper a lot as part of my work at Porter's Paints. I've learnt that although you may love a wallpaper pattern, if the scale is not right for the room it won't work. Here is a great example of scale and form that is just right framing the window with the organic shapes of the branches. 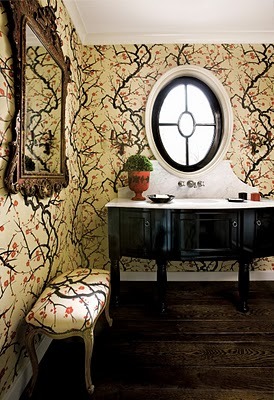 All the lines are curved - the vanity, the spalshback and the upholstery and I love the line up of the stool and the wallpaper on the left. This iconic paper is Flower Quince by Clarence House.